Figure 1 demonstrates the advantages of slotted holes using the example of a group of four anchors close to an edge. The front anchors are located in slotted holes and the group is loaded by a shear load perpendicular to the edge. As a consequence of the slotted holes concrete edge failure occurs at the back anchors, the effective edge distance increases to c = c1 + s1 and the characteristic resistance increases accordingly. In addition to shear loads in direction of the slotted holes simultaneously shear loads can act perpendicular to the slotted holes (Fig. 2a). This application is rare in practice and is not dealt with in the design guidelines. 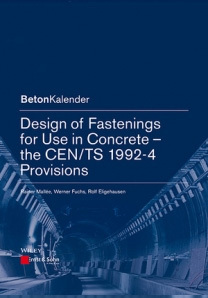 Consequently, no information is given about how to perform the proof of concrete edge failure. This task can be solved in accordance with the principles of the distribution and the magnitude of the shear loads according to ETAG 001, Annex C and TR 029, Section 4.2.2. Of course, the conditions of equilibrium are to be met. 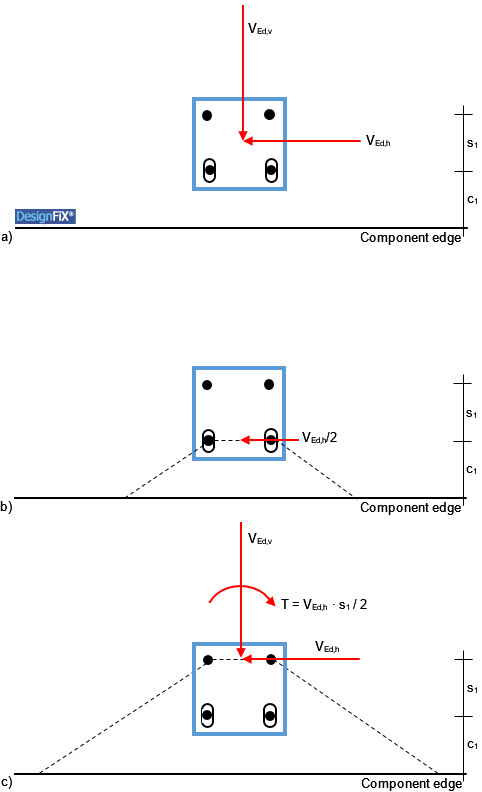 Figure 2a shows a group of four anchors close to an edge, which is loaded by a shear load inclined relative to the edge. The two front anchors are positioned in slotted holes. Since the concrete edge failure can occur at the front and at the back anchors a double proof needs to be performed. In the first proof concrete edge failure of the front anchors is assumed (Figure 2b). As the shear load acting parallel to the edge is distributed by definition on all anchors of the group the value of the design action is VEd = VEd,h/2. Because of the slotted holes no shear load is acting perpendicular to the component edge. In the second proof concrete edge failure of the back anchors is assumed (Figure 2c). Under this assumption the two front anchors are positioned in the failure body and therefore do not take up shear loads. This means that all the shear loads acting parallel and perpendicular to the component edge have to be taken up by just the two back anchors. However, the shear load VEd,h acts eccentrically relative to the centre of gravity of the two back anchors (e = s1/2). For reasons of equilibrium, the torsional moment T = VEd,h ∙ s1/2 resulting from this eccentricity has to be taken into account in the design. This will further increase in the example in Figure 2 the shear load acting on the right anchor, while the shear load on the left anchor decreases and with large torsional moment can even alter its direction. The described distribution of the shear loads on the individual anchors of a group is good engineering practice. Surprisingly, however, that some design programs available on the market neglect the eccentricity of the edge parallel shear load relative to the centre of gravity of the two back anchors and thus do not fulfil the equilibrium conditions. The resulting error increases with increasing ratios s1/s2 and/or VEd,h/VEd,v. Furthermore, the programs also distribute the shear load acting parallel to the edge on all anchors of the group although the two front anchors are located in the concrete failure body and therefore cannot take up any shear loads. In the following example it is shown that this approach can lead to unsafe design results. Figure 3 shows a group of four injection anchors M10 (steel strength class 5.8) close to an edge. The anchorage depth is hef = 60 mm. The concrete is cracked and normally reinforced and corresponds to the strength class C20/25. No edge reinforcement is available (no edge and hanger reinforcement). The component thickness h = 200 mm. The load-bearing capacity of the group is insufficient. The values of the design resistances for the failure modes steel failure and pry-out failure are less than the values of the design actions. Only the resistance for concrete edge failure is sufficient. This shows the benefits of slotted holes. Ignoring the eccentricity of the edge parallel shear load and thus disregarding the equilibrium can lead to unsafe design results. One gets the impression that the capacity of the fastening is sufficient, but this is definitely wrong if the eccentricity is taken into account correctly (see design approach No. 1). The International Federation for Structural Concrete (fib), an international association on matters of reinforced and prestressed concrete construction, has established a working group, which deals with fixing technology (Special Activity Group SAG 4: Fastenings to Structural Concrete and Masonry Structures). Its members include experts from many countries. 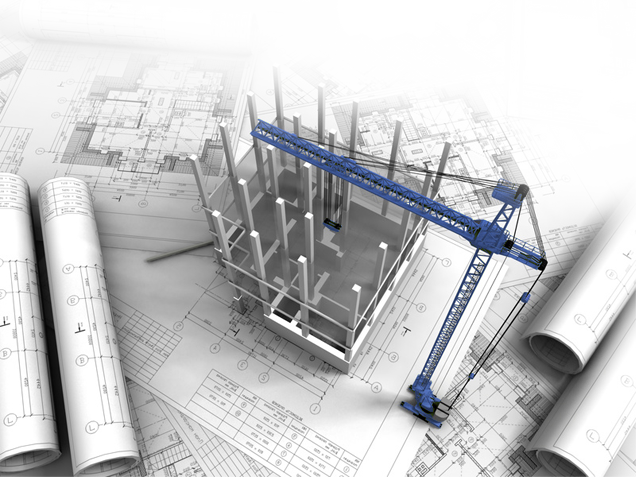 The group is a recognized authority on all matters of the design of anchors. 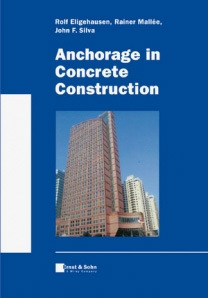 The results of many years of work of this group are summarized in a comprehensive report, which contains the current state-of-the-art (International Federation for Structural Concrete (fib): Design of Anchorage in Concrete. 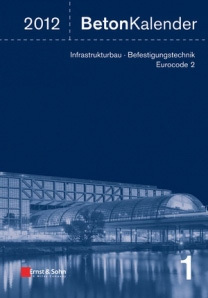 Bulletin 58, Lausanne 2011). 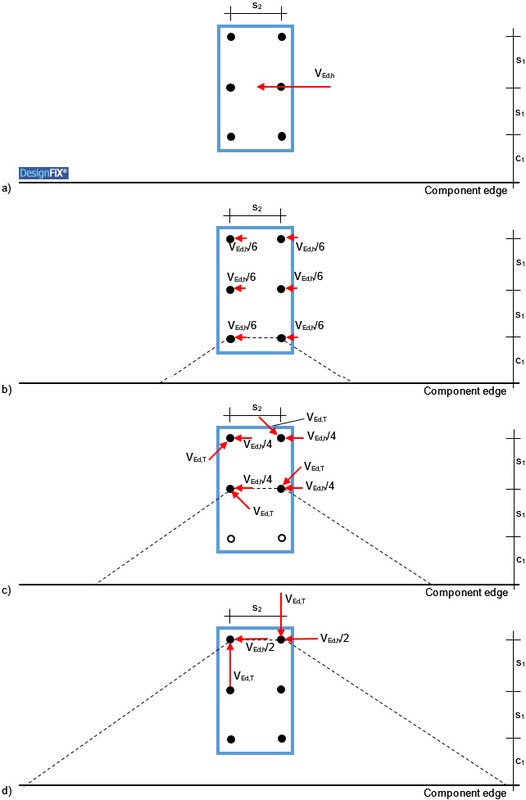 As in ETAG 001, no shear loads perpendicular to slotted holes are discussed in Bulletin 58, however, a comparable situation is described: The distribution of an edge parallel shear load on the individual anchors of group of six anchors close to an edge, while the failure crack runs either through the front, middle or rear anchors (Figure 4). If the failure crack runs through the front anchors (Figure 4b), then the shear load is VEd = 2 ∙ (VEd,h/6). The shear loads on the remaining four anchors need not be considered in the proof of concrete edge failure because they are located behind the failure crack (see ETAG 001, Annex C and TR 029, Figure 4.7). If the failure crack runs through the middle anchors (Figure 4c), then the edge parallel shear load is equally distributed among the remaining four anchors. In addition, the torsional moment VEd,T is taken into account, resulting from the eccentricity of the shear load VEd,h relative to the centre of gravity of the four anchors. The proof for concrete edge failure is performed for the edge parallel shear load VEd = 2 ∙ (VEd,h/4) of the two anchors located in the failure crack plus the load components resulting from the torsional moment that are directed towards or parallel to the edge. 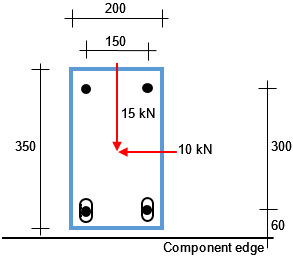 Shear components that are directed away from the edge may be neglected in the proof for concrete edge failure (ETAG 001, Annex C, Figures 5.8 and 5.9 or ETAG 001, TR 029, Figures 5.9 and 5.10, respectively). If the failure crack runs through the back anchors (Figure 4d), then the edge parallel shear load is equally distributed among the remaining two anchors. In addition, the torsional moment VEd,T is taken into account, resulting from the eccentricity of the shear load VEd,h relative to the centre of gravity of the two anchors. The proof for concrete edge failure is then performed for the edge parallel shear load of the anchors VEd = 2 ∙ (VEd,h/2) plus the load components resulting from the torsional moment that are directed towards the edge. The load distribution in Figure 4 confirms the correctness of design approach No. 1. This Trial version is designed primarily for anchor manufacturers and distributors, and includes the product range of a virtual company called Your Company. The demo version contains mechanical and chemical anchors which can be designed in accordance with ETAG 001, Annex C, TR 029 and TR 045. More information about installation and system requirements. 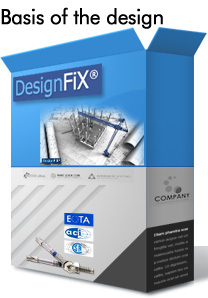 How to add your products in DesignFiX? Join our DesignFiX mailing list to receive the latest news and updates from our DesignFiX team. Copyright 2019: DesignFiX has been registered with the German Patent and Trademark Office and is a protected word and figurative mark.